Icheb's return to his home planet after his abduction by the Borg is difficult for Seven to bear when her awakening parental instincts make her suspicious of his parents. - In the cargo bay, Seven tells Icheb that she never saw her parents again after they were assimilated. However, in "Dark Frontier", Seven does see her father Magnus Hansen as a drone when she is with the Borg Queen. "Their first idea was to clone Naomi, but I suggested they start with something smaller." "I should have realized. You have butterflies in your stomach." "It's time for you to regenerate." "And if I choose to continue my studies?" This is a pretty dark episode, which isn't to say that it isn't good, because it's quite good, but at its heart, it's still about using a child as a Trojan horse to commit genocide on people who are trying to commit genocide against you. Some precedent for this in Trek; you can go all the way back to TOS with "The Mark of Gideon", in which the Typhoid Mary is used against her own people, to combat overpopulation, and TNG's "I, Borg", in which there's some discussion of using Hugh against the Borg in a similar fashion; this episode has the sacrificial lamb, as it were, as the child of the people perpetrating the scheme, similar to the TOS episode. You also have a similar Trojan horse/Typhoid Mary scheme in the last season of DS9. It's debatable whether or not it should have dealt with some of the implications of the Brunali scheme to bring down the Borg more directly or in depth. One of the most chilling things about this rewatch was how much the younger Brunali were into maintaining the deception that everything was hunky-dory and they'd play Brunali-ball after work and there's stargazing at night, etc. It was unclear to me just how young Icheb was when he was originally assimilated (I hadn't realized that the maturation chambers sped up physical growth), but the younger Brunali are acting like he's their best bud, even though he doesn't remember them. There's also a lot of subtext about the adoptive/foster parent suddenly and/or unexpectedly having to give their child back to the birth parents; even though Seven had to have known that that was the end game for all the kids, she doesn't seem ready for it at all, and it's just a matter of luck (of sorts) that it turned out to be a false alarm, this time. Good acting all around, especially from Ryan; it's really something to watch her modulate her emotional responses to different things. Mark A. Sheppard (not to be confused with Mark Allen Shepherd, who played Morn on DS9) has been in quite a few things, including Supernatural and Firefly. Sheppard's father played the Ahab-esque Qatai in "Bliss." Also, fine work from Tracey Ellis, who plays Icheb's mother. And, of course, the science fair was cute. "We cloned a potato!" "I made an ant farm!" "I made a globe!" "Oh, this? Just something that we might actually be able to use." Poster's Log, supplemental: Memory Alpha notes that there was also an issue of the old Gold Key Star Trek comic titled "Child's Play"; it was sort of a cross between the TOS episode "Miri" and any other TOS episode in which Hodgkin's Law of Parallel Planetary Development is used to explain why you have a culture almost identical to one of Earth's, in this case medieval Europe. Here's some bits of the comic; the Gold Key comics weren't that great, but for the decade between TOS and TMP, along with the animated series, it was all we had. Also, if I'm not mistaken, the big sort of crater-thing that the Brunali settlement is in is probably the remnant of the Borg assimilating an entire village, as was seen at the beginning of "The Best of Both Worlds." Nice continuity touch there. Particle of the Week: The unnamed Brunali pathogen, same as in Icheb's introduction. As noted in the post, Mark Sheppard is in this one. * This one rubbed me the wrong way, but I really had to think about it to articulate why. Usually, it's easy to put my finger on why I don't like... well, anything I don't like, but especially within the greater Star Trek franchise. Also, as Jack talks about above, this one has a lot of the ingredients of a good story: it's dark, it actually bothers with some continuity for a change, it features another strong performance by Jeri Ryan and so on. My usual complaint of laziness does not feel correct here - Child's Play gives the appearance of a story that received some thought and effort. Having slept on it, I think it's that the twist feels too sudden. People don't react to this the way I'd expect them to: the Brunali themselves are too casual around Icheb. They don't look desperate. They don't look hungry. They don't really act war-torn. I'd just expect people who would be willing to do this to be more upset generally. On the Voyager end of things, they're pretty casual about the possibility of a Borg encounter, especially given that their presence would draw any passing Borg vessel back toward the planet. Them just being there puts everybody in more danger, but nobody really talks about it. Finally, launching Icheb before Voyager's had a little time to get out of range strained credulity - if they're good enough at manipulation to put on such a good front for Seven, you'd think they'd wait a day or two to launch Icheb to avoid the possibility that Voyager's fancy scanners would catch that. So basically, this didn't click for me on a pacing or emotional level, despite looking like it might work on paper. It's too abrupt. It's debatable whether or not it should have dealt with some of the implications of the Brunali scheme to bring down the Borg more directly or in depth. Anyway, no qualms about people liking this better. It just didn't click for me, and I think this is most of why. It's a good, thoughtful story with a solid scifi concept that makes great use of characters we know, situations that are familiar and with believable science. We have continuity with the Borg children (is that three episodes in a row that show them?) and the storyline makes sense. The kids are fun, funny and interesting and I really loved the interactions between Icheb and Seven. Two things I don't remember noticing when this first aired. 1) Transwarp conduits are now fixed tunnels through space, rather than something created by a ship's engines. I don't quite know how I missed it, but the earlier versions of transwarp had the ship creating it's own conduit (see Timeless, etc.) Now the conduits have an entry and exit point. I'm pretty sure the show will be consistent about this going forward. 2) The Borg are known for assimilating entire civilizations but they're "eating" the Brunali piecemeal. Is this new behavior? I don't remember seeing them only attack a civilization when its tech rises to a certain level of sophistication. We're entering a section of Season 6 with what I think are three excellent upcoming episodes interspersed with some ho hum ones, which is a nice change of pace. Transwarp conduits are now fixed tunnels through space, rather than something created by a ship's engines. Voyager's fuzzy on that point, but my understanding of the situation is that there are lots of different kinds of transwarp - kinds of engines, fixed facilities and so on. I think the Borg channels here are supposed to be much faster than their (already fast) cubes can go, and also allow them to shuffle smaller scout ships (like the much less powerful sphere) around more easily. The Borg are known for assimilating entire civilizations but they're "eating" the Brunali piecemeal. Is this new behavior? 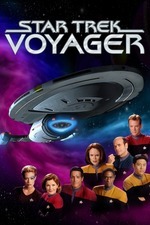 In rare defense of Voyager: it's not. Before the Borg themselves appeared, their existence was hinted at on TNG by them scooping up smaller installations along the Neutral Zone, presumably to determine if they really needed to eat the whole civilization. Sheppard's father played the Ahab-esque Qatai in "Bliss." !! So Rura Penthe Warden is Badger's dad!? Awesome. Agreed. I don't DISlike this one—the Guest Villain-Parents are engaging and it's definitely a different sort of Borg story, which is always good to get. And VOY wisely started giving Icheb some development early. It's just that the script is so patchy and rushed that you get the feeling the writers fixated too much on the adoption-allegory, and neglected certain necessary plot and character beats. By the way, anyone else have a hard time looking at Icheb and not seeing Zach Woods? Not sure that I can unsee it now, which might lead to a mental Voyager/The Office mash-up.